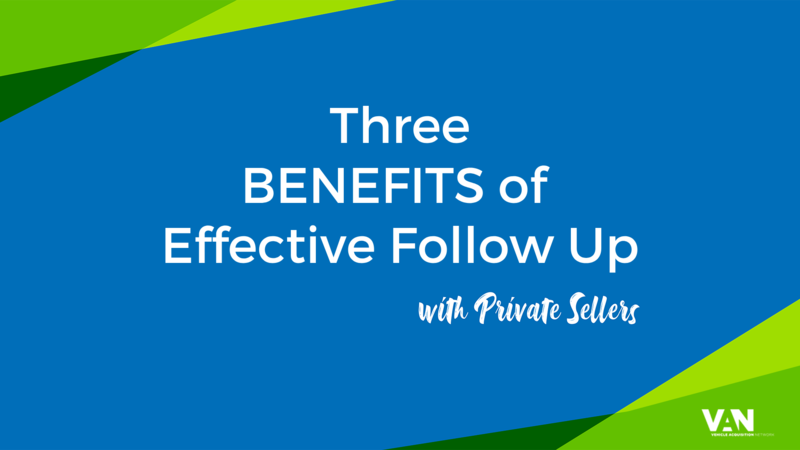 The idea of follow up in sales might seem like a fundamental concept, and it is. However, there is a difference between effective and ineffective follow up. And when it comes to buying cars from consumers, effective follow up with private party sellers is a learned skill that is unique to the business. Perhaps one of the best ways to be effective in your follow up efforts is to understand the benefits. Not necessarily how you and the dealership benefit. But how the consumer benefits. In last month’s post – The Power of Follow Up – we looked at why follow up is important and the value of meaningful contact. Follow up is important because the seller has many challenges, and you have the ability to help with those. As David Long, COO of The Niello Company points out in this recent best practices and training webinar – effective follow up is the magic behind every successful buy center. The video featured in this post is a preview of the complete webinar we had recently with Long as part of the monthly VAN University Best Practices and Training Webinar Series. The premise of the webinar was on the power of follow up with consumers. Long joined us to share tips and ideas his team deploys at his dealer group in California. One of the ideas Long shares in this webinar is the Rule of 7 – the idea or practice of contacting the seller up to 7 times in the 3-4 week period from when they begin attempting to sell their vehicle. As Long shares in the video, his dealer group when from acquiring 50 cars a month to 150 by optimizing their follow up process and implementing the Rule of 7. One key benefit to effective follow up is that you can demonstrate that you want to be the seller’s advocate. Many dealers are trying to make the best deal possible and/or sell the consumer another car. But the consumer just wants to sell his car. He or she doesn’t need other stresses. By focusing on their need, and being their advocate, you create value and you differentiate your dealership. Another key benefit is Top of Mind Awareness. Following up multiple times over a brief period keeps your dealership at the forefront of the seller’s mind while they attempt to sell their car. The market educates the consumer better than your team can, and you know the chances of them selling privately are not as likely, but they don’t know that yet. We talk about this in the webinar and in last month’s article. Finally, most dealers won’t be following up with them diligently, if at all. And the consumer certainly is not going to come to you. By following up, you create the opportunity to be there when the consumer needs you and is ready to sell. You give your dealership a chance to be there when the time is right FOR THE SELLER. The video featured in this post includes highlights from this month’s VAN University webinar. For the complete recording, you can sign up for VAN University in the Learning Center. By doing so, we will send you access to this and all other videos in the library. Including future ones. VAN University is free to all dealers. No purchase is necessary and you may unsubscribe any time.